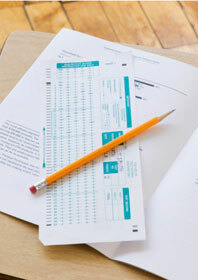 The SAT and ACT exams recently made headlines when they announced enhanced security measures that will take effect during the upcoming 2012-13 academic year. Apparently, a few bad eggs were caught paying other people as much as several thousand dollars to take the tests on their behalf. The imposters simply used easily acquired fake IDs to gain entrance on exam day. Both the students who took the tests and the students who paid them to do so were arrested. Both exams will require students to submit a photo that will be checked against the photo ID they bring on exam day. Students who don't have an approved form of photo identification may bring a notarized letter with a photo. Students must sign a statement affirming their identity and acknowledging that assuming someone else's identity may be punishable by law. Students must specify their gender and date of birth. One of the students arrested in the aforementioned cheating scandal was a boy who, with the help of a fake ID, was able to take a test for a girl with a gender-neutral name. Standby testing will be done away with. Only students who appear on the roster on the day of the exam will be able to take it. On the day the exam is administered, the photo that students submitted when they registered for the test will be printed on their admission tickets and the testing center's roster. Test proctors will be able to compare that picture to both the photo ID the student presents as well as to the student's face. For the first time, students will also be required to submit the name of the high school they attend, to aid in the identity verification process and so their scores can be sent to the school. The SAT will also submit students' pictures along with their scores. These new procedures will provide an opportunity for administrators and counselors such as yourself to watch for the telltale signs of cheating, such as uncharacteristically high scores. The ACT will begin enforcing these changes after the beginning of the new school year (visit their Newsroom page to learn more). The SAT is already requiring students to submit a photo (visit their Photo Requirements page for details). While these new requirements and procedures may not entirely eliminate cheating, I do think they make great strides toward that end. At the very least, you and your students should feel more confident that the scores they've worked so hard for aren't being diluted by droves of cheaters. What do you think of the new identification requirements? Will they help put an end to cheating on standardized tests? Discuss it in the comments.